Home/Random/A Potter in a Time of Global Climate Change — Fiddling While Rome Burns? My foot slips off of a tussock of swamp grass and sinks into rich black smelly muck as I cross the wettest part of the woods to get to the ferns I’m after. Forest, my black lab, bounds ahead of me. I bend low to get under a tangle of greenbrier, then get my face swiped full-on with a spider web. A warbler calls from the tree canopy. I am in one of my favorite places in the world: a piece of extremely diverse woodland, traversed by a small river and owned by a fellow potter, in the eastern foothills of the Blue Ridge mountains. The exact coordinates are 38.2 latitude, 78.6 longitude. I have been collecting plant specimens in these woods, among other places, for almost 20 years now, to use in my pottery work. In the very early spring, I look forward to finding Dutchman’s Britches and Cut-leaf Toothwort, Violets, Jack in the Pulpit and other ephemerals. A little later the Bloodroot and Mayapples appear, then Virginia Waterleaf, Water Hemlock, Snakeroot, Spicebush, Indian Cucumber, False Solomon’s Seal, and the ferns. So many ferns. They range from tiny Grape Ferns and Spleenwort to giant fronds of Wood Fern and Royal Fern; delicate, lacy Maidenhair Ferns and Lady Ferns grow next to hardy Christmas Ferns, Polypodys, and Marginal Shield Ferns. I am careful, when collecting, not to disturb the roots of any plant, and I also try to keep the woods clear of invasive species like mustard. My work day almost always begins with a walk in the woods, with my dog, and I find it wonderfully grounding and inspiring. 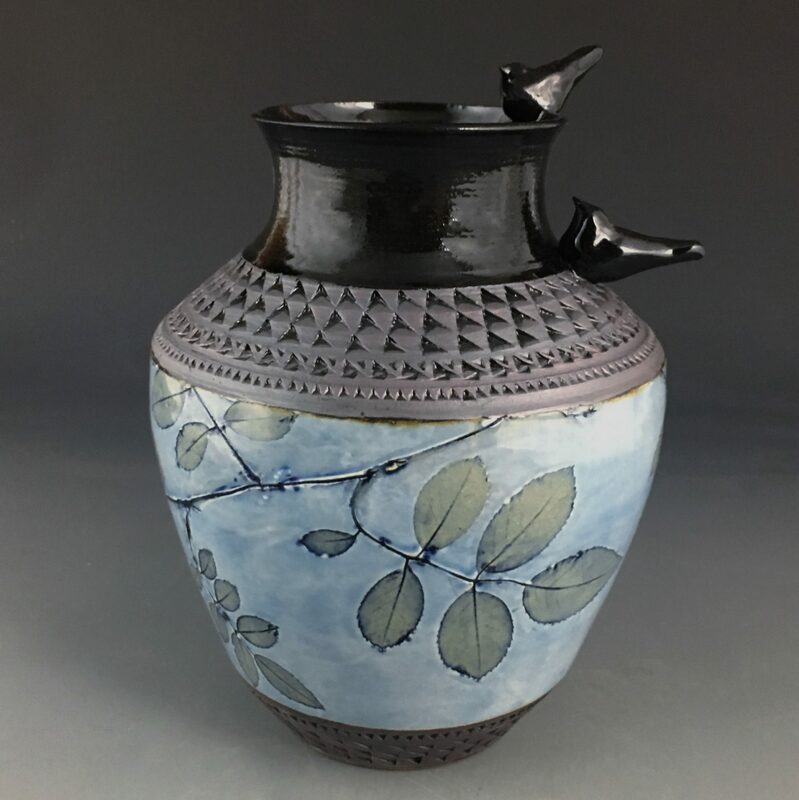 The pots I will throw on any given day are determined, in a large part, by the shapes and sizes of the plants I find, and so the pottery I produce is somewhat seasonally determined. If I have an order to fulfill, I sometimes have to structure my morning walk around where I know I can find a particular plant to make that order. And sometimes my customers have to wait for the right season to roll around again before I can make a pot with their desired botanical specimen on it. This dependence on the seasons, and on being able to find particular plant specimens (that haven’t been too eaten up by bugs), has made me acutely aware of how our seasons are shifting with climate change, of how, 50 years from now, the plants that I so easily find now may not be able to survive the climate we will have then. And these thoughts have led me, full circle, back to my earliest pots, which were inspired, in part, by pot shards found by archeologists. 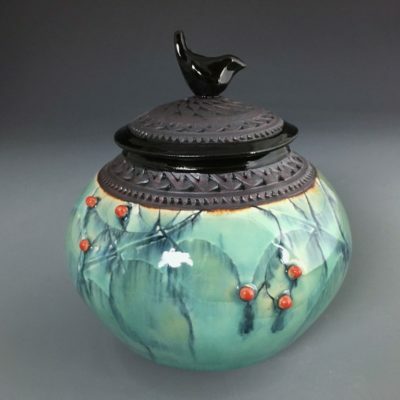 My early pieces were very self-conscious tributes to the black and red ware of Greece, except, instead of depicting scenes from Greek myths or from daily life on the sides of my urns, I depicted the flora around me, as I still do now. I was using a deep red clay body with a black slip, and the ferns and leaves stood out red against the black background of the pots. As archeologists were able to learn much about Greek life and culture from mere pot shards, I’ve often wondered what some archeologist 2000 years hence, might learn from a potsherd of mine. Aside from the observing the obvious health of the studio pottery scene at the turn of the millennium, he or she will also find a little piece of an artistic fossil rendering of a plant that lived in our time. And our time, it turns out, is more significant than we might think as global climate change seems to be manifesting itself more rapidly than predicted. 2016 so far is the hottest year on record, and 2015 was the hottest year before that. I cannot remember a hotter September in Charlottesville. The tender plants I gather to press onto my pots are often the first to register a change in climate. I found far fewer Dutchman’s Britches this spring, but far more Snakeroot, for instance, in one patch of woods I haunt. In my own self-flagellating way, I sometimes worry that I am fiddling while Rome burns by continuing to work as a potter. But then I also wonder if what I am doing is more like the musicians on the Titanic, who continued to play their instruments, to provide at least a semblance of civility within the chaos, to do what they knew how to do best, in the face of a crisis. I don’t know. I’m just a potter making pots and tile murals. But I have decided to bring a little more attention to where and when my pieces were made, to ask people to think about the fact that these pieces of pottery and these tile portraits are a record, a testimony, of the gift of our botanical diversity, right here, right now. That diversity is rich with pattern and beauty and deserves to be celebrated, and, if possible, preserved, through political action. The only way to do that is to bring attention to it, to notice it in the first place. 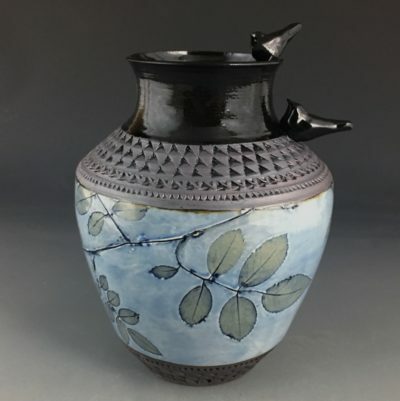 Incorporating botanical beauty and diversity into art pottery is my way of asking people to notice, to take heed. Perhaps this Titanic doesn’t have to sink. 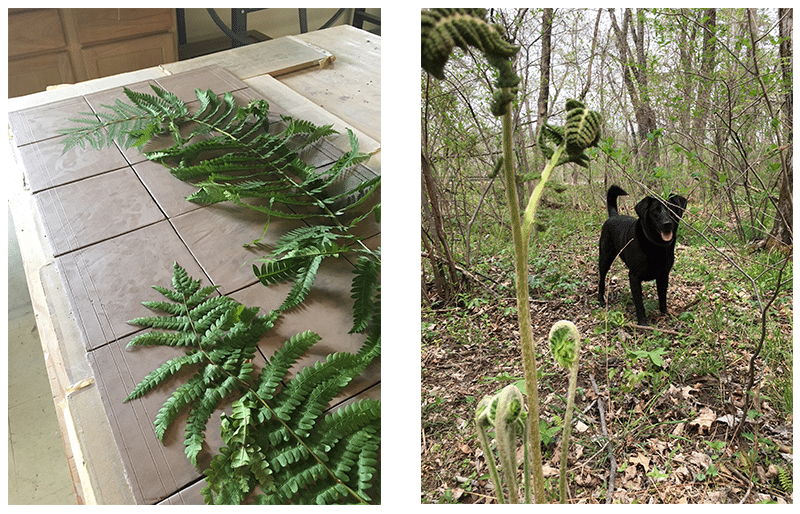 Fern Portrait Group, 38N -78W Summer 2016, includes tile portraits of 16 fern varieties. Each is framed in solid American cherry or walnut. I have mounted these tiles in such a way that they are removable from their frames, so that the group can be bought either with the frames or without, if one wishes to install the tiles architecturally in a wall. This is the first of a series of tile portraits celebrating botanical diversity which I hope to make over the coming years. These portraits will be labeled with longitude and latitude and date, and will be made in an effort to raise awareness of the diversity and fragility of the flora around us in this era of global climate change. I am happy to discuss commissions for architectural installations, corporate, hotel, or restaurant applications, or individual homes.